In the first days of 2011 I could not resist anymore and I rang the carver of the report in order he could drill the briar for me and gave me a stem. Holes done…then the shape was my work, I enjoyed so much that I get hooked on with this kind of work. Then I started to research providers for the essential goods I would need to continue with my, in that moment, “new hobby”. Briar, pre-molded stems, stains, buffs…all those crazy thing that all the pipe makers use to transform a simply piece of wood to an amazing relaxing tool of pleasure. in June 2012 I shown my work for the first time in the Barcelona Pipe Club, I was amazed about the quite good acceptation of my rookie work. 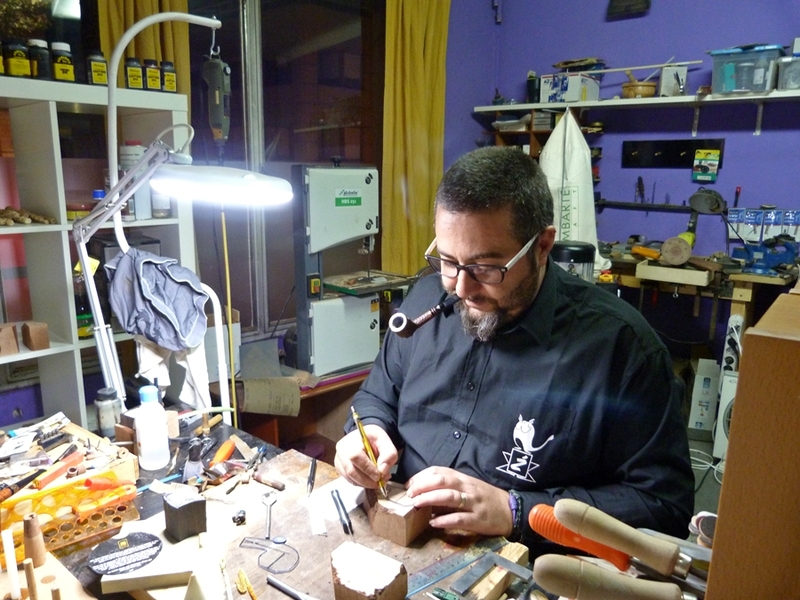 That encouraged me to make another step…I decided to show my work more and assisted as an exhibitor to the British Pipe Smoking Championship on July 2012. There I met Chris Askwith , his tips, as always, resulted to be very useful an encouraging. I finished the year 2012 assisting to the European Championship in Seville…and there I met my Master, Dirk Claessen, we shared and talked a lot, and after the weekend of the competition he invited me to visit his workshop. 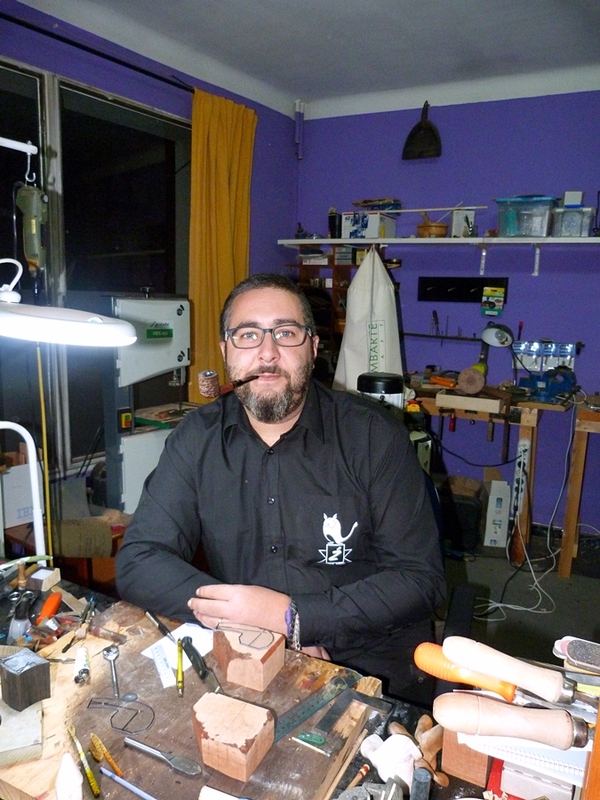 So I began the 2013 visiting the Claessen’s Workshop…and there I realized that, till that moment, I didn’t know anything about making pipes….OMG, how much new information I got. That weekend became a new start for my work and my conception of pipe making. After that encounter a lot of things changed in my workshop. My wife became my quality controller and the most encouraging aid…when I get stuck she always push me to try it again. This year has been very intense, attending so many places: Barcelona, England, Poland and meeting so many interesting people, and a lot of new friends. All of them with a lot of new information, tricks and tips about our loved work, I met pipe makers as James Gilliam from Jsec pipes, Jan Kloucek from Jan Pipes, Georgi Todorov from Getz Pipes, Rafa Martin from Pipes Martin, Wojtek Pastuch from Pastuch Pipes….I could list a lot more of my new “pipe friends” but this was supposed to be about me. The most important thing is…never give up!